A single-mode fibre Bragg grating is similar to an ordinary optic fibre, but has variations in the refractive index of the core. This results in a specific wavelength (the "Bragg wavelength") being reflected via the same mechanism that results in so-called atmospheric Bragg scattering. In this example the incoming wave is only partially reflected; a real fibre Bragg grating could have thousands of fluctuations resulting in more complete reflection as well as narrower spectral filtering. Another animation shows how the same fibre with a slightly different wavelength leads to no reflection. Thanks to Joss Bland-Hawthorn (University of Sydney) for suggesting this animation. 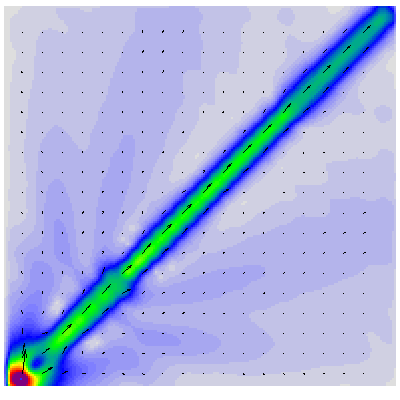 This is an animation of the component of the electric field out of the plane of the page. The direction in which energy is travelling at any instant is proportional to the cross product of the electric and magnetic fields, known as the Poynting vector. 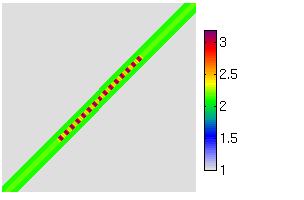 The arrows show the direction of the Poynting vector averaged over the simulation, while the colours show its strength.